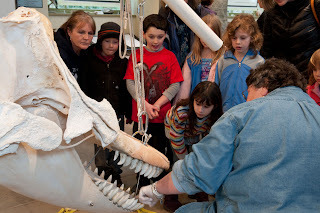 “Guests to our new Learning from Orcas exhibit will be able to look for clues that forensic scientists use in their investigations to discover more about toxics in the Salish Sea that affect whales and other marine life,” said Anne Murphy, executive director for the PTMSC. Various stations will have clues to help you solve the mystery of what happened to Hope, the orca that was stranded on Dungeness Spit in 2002. If you gather up all the clues and write your answers, you’ll receive an orca pen and be entered to win a raffle for a prize. You can also work with a docent to investigate your favorite everyday products and how they rate in terms of toxics. Admission is $5 for adults, $3 for youth and free to PTMSC members. A Discover Pass is needed to visit Fort Worden State Park.